Practically immediately after the Soviet Union sent the first cosmonaut into orbit, the Moon became the destination for human space flight. In May 1961, President Kennedy proclaimed the lunar landing on the surface of the Moon before 1970, as the main goal of the US human space program. However, the Soviet government was not in a hurry to respond to the US challenge, initially limiting its participation in the Moon Race by preliminary studies of circumlunar missions. In 1962, four departments within Sergei Korolev's OKB-1 design bureau began studies of possible scenarios of lunar expeditions. Among multiple concepts, engineers investigated possible lunar flyby missions, which would require less rocket power than actual landing expeditions. Two such scenarios were under consideration. The first plan involved a pair of launch vehicles based on the R-7 rocket and carrying the 7K (Soyuz) spacecraft and the separate Earth-orbit escape stage propelled by liquid hydrogen. At the end of 1962, OKB-1 was reviewing various scenarios of lunar and martian expeditions, which could take advantage of the prospective N1 rocket with the expected payload of 75 tons to the low Earth's orbit. Four architectures were chosen out of 26 possible schemes to put cosmonauts on the lunar surface. The favored scenario required three N1 rockets launching the 19K lunar expeditionary system and a pair of 21K tankers for in-orbit fueling of the 19K ship. 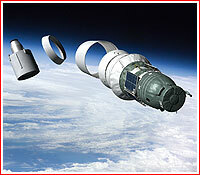 The crew would be delivered later on the vehicle derived from the 7K spacecraft. The expedition would use a direct descent to the lunar surface, skipping complex and dangerous rendezvous in the lunar orbit. By 1963, OKB-1 formulated the whole array of lunar exploration projects. 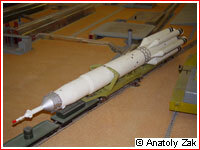 The L1 circumlunar mission concept was at the root of the 7K (Soyuz) spacecraft development, which would be a part of the three-component mission, all of which would be launched by boosters derived from the R-7 ballistic missile. The same strategy also proposed the L2 unmanned lunar rover, the L3 complex for an expedition to the Moon and the L4 lunar orbital station and the L5 crew-carrying lunar rover. For the time being, the L3 lunar landing project became a focus for OKB-1 during most of 1964. It took more than three years after Kennedy's speech in 1961 for the cash-strapped Soviet government to commit needed resources for the manned expedition on the surface of the Moon. "Do not leave the Moon to the Americans," Nikita Khrushchev reportedly told leaders of the Soviet rocket industry, "...Anything you need in order to do it, will be provided." On Aug. 3, 1964, the Soviet government finally gave full go ahead to the lunar landing effort with Decree No. 655-268. 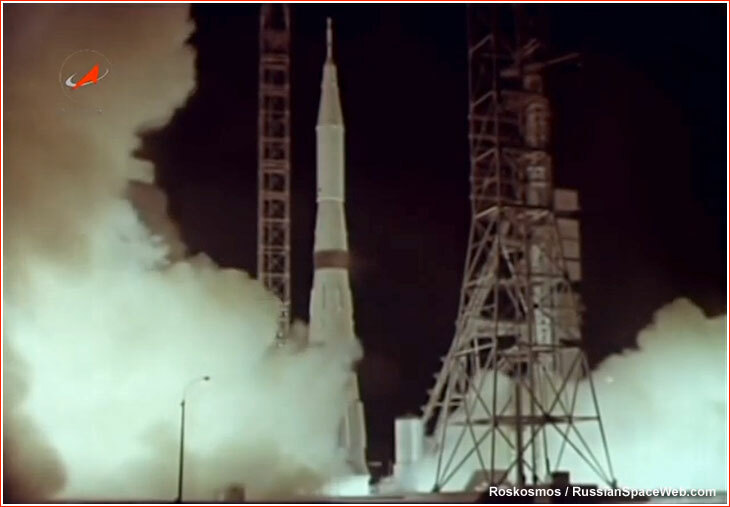 The now secondary task of the lunar flyby was delegated to Vladimir Chelomei's own spacecraft launched by the newly developed UR-500 (Proton) rocket. At the same time Korolev could now focus on the much more difficult but prestigious task of beating the Americans to the Moon with his L3 lunar landing system. However, the development of a heavy-lifting launcher, needed for the lunar expedition, was plagued with political and technical problems. Powerful captains of the Soviet rocket industry fought for the leadership and influence in the program, stretching the project's already limited resources, while the Soviet military, which financed rocket development, had always remained skeptical about the prospects of giant space launchers. At the end of 1964, Korolev also approved the idea to dock a pair of the 7K spacecraft in the Earth's orbit as a rehearsal of future operations during lunar expeditions. The Soyuz variant proposed for this purpose was designated 7K-OK, where the "7K" designation was inherited from the original manned vehicle in the lunar fly-by project, while "OK" stood for "okolozemny korabl" or "near-Earth-orbital spacecraft." The fall of Khrushchev in October 1964, further delayed the program, which continued suffering from the lack of funds and resources. The Oct. 25, 1965, a government decree formally approved the development of the 7K-OK Earth-orbiting spacecraft, in parallel with the work on the 7K-L1 variant, which aimed to fly behind the Moon before the Apollo. In January 1966, the Soviet lunar program recieved another blow with the death of Sergei Korolev. 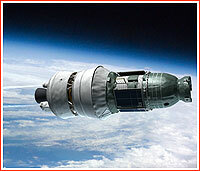 After many delays, the first unmanned Soyuz 7K-OK spacecraft was finally launched in November 1966. On Feb. 4, 1967, the Soviet government issued another decree, which proclaimed the flight around the Moon and the human landing on its surface a task of "state importance." The document required the circumlunar mission to be accomplished between June and October 1967. The flight testing of the 7K-L1 system began in March 1967, with the largely successful launch of the UR-500K rocket variant delivering the 7K-L1 No. 2P unmanned spacecraft prototype. 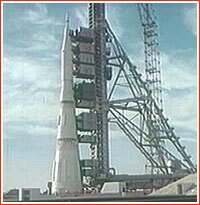 The N1 moon rocket had not reached the launch pad until 1969, and its first and three subsequent test missions ended in catastrophic failures, revealing serious technical flaws in the design of the booster. The program was finally abandoned in 1974 and its leader Vasily Mishin was ousted as a head of the industrial conglomerate responsible for the project. Destroyed on Pad 31 due to an accidental ignition of the emergency escape system, resulting in three fatalities. A lunar lander test in the Earth orbit. The Proton rocket with the 7K-L1 spacecraft for the circumlunar mission is poised for launch in Baikonur on Nov. 22, 1967. 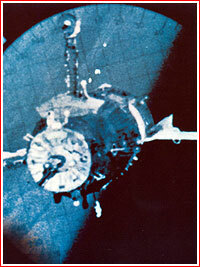 Soyuz-4 photographed from Soyuz-5 during undocking on Jan. 16, 1969. The N1-L3 complex during its assembly at Site 112 in Tyuratam. The N1 moon rocket leaves the assembly building at Site 112 in Baikonur.